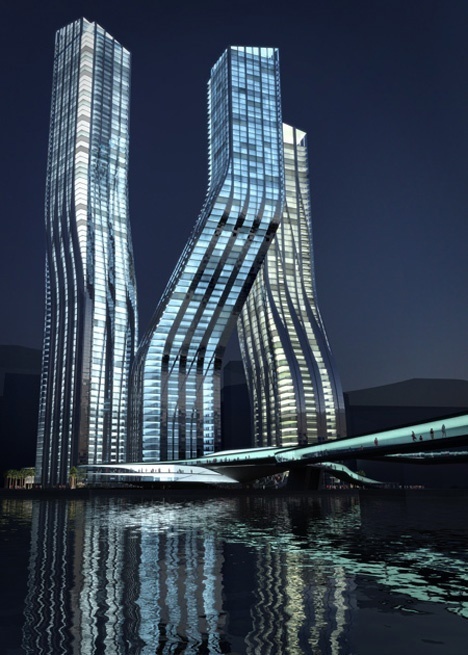 Signature Towers (formerly known as Dancing Towers) is a proposal for a three-tower, mixed-use complex in Dubai, United Arab Emirates. It was designed by Iraqi born architect Zaha Hadid after winning an international design competition which included proposals from OMA and Reiser & Umemoto among others. The developers are Dubai Properties, the company responsible for the earlier Jumeirah Beach Residence. Apart from these three towers, the project would also include a new building to house the Dubai Financial Market, a large podium containing retail space and a pedestrian bridge crossing the creek extension.